shaped tongs and made tools. Both verses 7 and 8 show the Æsir busy and happy, first making the sorts of status tools and accoutrements that an aristocratic society would expect, then kicking back and playing chequers and not lacking for gold (were they betting?) until three giant maidens appear and seem to cast a shadow over the Æsir’s peace. Stanza 60 then shows us the gods meeting at Iðavöll again, and reminiscing about what they have just been through. 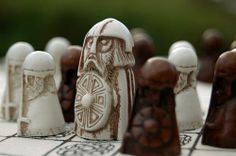 Interestingly, their memories are balanced between the chthonic might of the World Serpent and the magical wisdom of Odin – perhaps the new world aims to reconcile them as Baldr and Hodr are reconciled in 62. Or perhaps they are no more, as stanza 61 mentions their golden chequers, but no disruptive giant maidens. Snorri is obviously riffing off the passages in Völuspá, although he places Iðavöll in the centre of Asgard, and implies that Glaðsheimr and Vingólf are within it. In keeping with his euhermistic view of the gods, he describes them laying down earthly laws instead of naming the times of day and the year. He does mention the three women from Giantland and their disruption of the Æsir’s peace, but not what they did to cause this. (There are several different theories about this.) He mixes together stanzas 6 & 7 of Vsp, since in 6 the Æsir went to their holy place to lay down the times, then relaxed at Iðavöll in 7. His account of the post-ragnarok world follows Vsp. closely, however, with the reconciled gods discussing old times. (Snorri adds in the Fenris Wolf, which breaks the symmetry of Odin and the Serpent, perhaps because the wolf killed Odin.) In this new, paradisiacal land, the giants and their monstrous leaders are only a memory. Hedeager (151) thinks that the events in stanzas 6 – 8 show the gods learning to master the arts of making things. This leads to them having all they could wish for, including copious amounts of gold. Their hall, Glaðsheimr, was made entirely of gold. She connects the arrival of the giant maidens with the creation of the dwarves that follows, as if the women robbed the Aesir of the ability to make their own tools and smelt their own gold, so that they had to create the dwarves to do it for them. There are several theories about the name Iðavöll (although Orchard just has “splendour-field”). Simek (170) also mentions this as a possibility, and says that it fits with other names like Glaesisvellir, but doesn’t seem convinced. He offers two more possibilities: 1) “field of activity” from iðja, activity, which makes sense, or 2) “continually renewing, rejuvenating field” from iðuliga, continual, and iðgnógr “more than enough” since Iðavöll is the new world after ragnarök.Lindow also mentions the “eternal” theory, as well as the possibility “shimmering”. He leans towards the first, as it outlasts Ragnarok, and the new gods meet there. This raises a question: is Iðavöll connected to that eternal, renewing goddess, Iðunn? The words come from the same root, and both have a renewing function. 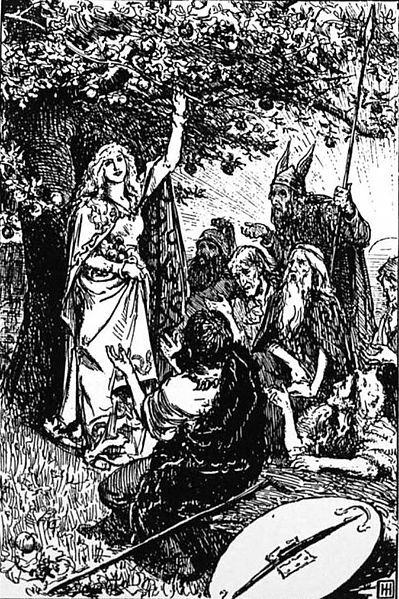 Because of Snorri we tend to think of Iðunn’s rejuvenating power as coming from her apples, but the 9th-century poem Haustlöng describes her as “the maiden who undestood the eternal life of the aesir”, which is a very different proposition. As Lindow points out (199): “the etymological meaning of her name – “ever young” – would premit her to carry out her mythic funciton without apples.” Apart from this, Simek mentions a further possibility, that the historical Idisaviso may be connected to the plain of Iðavöll. The name comes from Tacitus’ account of the battle between Arminius and Germanicus, and it means “plains of the Idisi”. Apart from that, the word idis turns up in the Germanic languages as meaning a woman of status, something like the Roman matron. Because of this, Simek (171) and many others have connected them with the Germanic mother-cult recorded in Roman times. Simek suggests that Iðavöll is possibly derived from Idisaviso. (170) This would connect it to the Idisi, who overlapped with the Matres. These goddesses, holding baskets of fruit or flowers, and sometimes a child (see Matrona) would connect to Iðunn and her “rejuvenating, renewing” power. Iðavöll symbolizes that same promise of renewal: a Golden Age in the past when the cosmos’ inhabitants were able to provide for all their needs, and gold was abundant, which will come again after a period of tribulation. No wonder some think that Völuspá was influenced by Christianity. However, I think it this is a universal dream; the idea of a fall from an easier, simpler time is universal, as is its correlate, the desire to regain it. Clunies Ross, Margaret, 1994: Prolonged Echoes: Old Norse myths in medieval Northern society, vol. 1, The Viking Society Vol. 7, Odense UP. Hedeager, Lotte 2011: Iron Age Myth and Materiality: an Archaeology of Scandinavia AD 400 – 1000, Routledge. Orchard, Andy, 1998/2002: Cassell Dictionary of Norse Myth and Legend, Cassell, London. Simek, Rudolf (trans. Angela Hall), 1996, Dictionary of Northern Mythology, D. S. Brewer, Cambridge. Totally right. Idavöll is one of the many names of the Great Square of Pegasus, the Field, and Idunn is Andromeda directly next to it. So either the field is named after Idunn or vice versa.